This article is about angling. For other uses, see Fishhook (disambiguation). A fish hook or fishhook is a device for catching fish either by impaling them in the mouth or, more rarely, by snagging the body of the fish. Fish hooks have been employed for centuries by anglers to catch fresh and saltwater fish. In 2005, the fish hook was chosen by Forbes as one of the top twenty tools in the history of man. Fish hooks are normally attached to some form of line or lure which connects the caught fish to the angler. There is an enormous variety of fish hooks in the world of fishing. Sizes, designs, shapes, and materials are all variable depending on the intended purpose of the fish hook. Fish hooks are manufactured for a range of purposes from general fishing to extremely limited and specialized applications. Fish hooks are designed to hold various types of artificial, processed, dead or live baits (bait fishing); to act as the foundation for artificial representations of fish prey (fly fishing); or to be attached to or integrated into other devices that represent fish prey (lure fishing). The fish hook or similar device has been made by man for many thousands of years. The world's oldest fish hooks (they were made from sea snails shells) were discovered in Sakitari Cave in Okinawa Island dated between 22,380 and 22,770 years old. They are older than the fish hooks from the Jerimalai cave in East Timor dated between 23,000 and 16,000 years old, and New Ireland in Papua New Guinea dated 20,000 to 18,000 years old. An early written reference to a fish hook is found with reference to the Leviathan in the Book of Job 41:1; Canst thou draw out leviathan with a hook? Fish hooks have been crafted from all sorts of materials including wood, animal and human bone, horn, shells, stone, bronze, iron, and up to present day materials. In many cases, hooks were created from multiple materials to leverage the strength and positive characteristics of each material. Norwegians as late as the 1950s still used juniper wood to craft Burbot hooks. Quality steel hooks began to make their appearance in Europe in the 17th century and hook making became a task for specialists. Commonly referred to parts of a fish hook are: its point, the sharp end that penetrates the fish's mouth or flesh; the barb, the projection extending backwards from the point, that secures the fish from unhooking; the eye, the loop in the end of the hook that is connected to the fishing line or lure; the bend and shank, that portion of the hook that connects the point and the eye; and the gap, the distance between the shank and the point. In many cases, hooks are described by using these various parts of the hook, for example: wide gape, long shank, hollow point or out turned eye. Contemporary hooks are manufactured from either high-carbon steel, steel alloyed with vanadium, or stainless steel, depending on application. Most quality fish hooks are covered with some form of corrosion-resistant surface coating. Corrosion resistance is required not only when hooks are used, especially in saltwater, but while they are stored. Additionally, coatings are applied to color and/or provide aesthetic value to the hook. At a minimum, hooks designed for freshwater use are coated with a clear lacquer, but hooks are also coated with gold, nickel, Teflon, tin and different colors. There are a large number of different types of fish hooks. At the macro level, there are bait hooks, fly hooks and lure hooks. Within these broad categories there are wide varieties of hook types designed for different applications. Hook types differ in shape, materials, points and barbs, and eye type, and ultimately in their intended application. When individual hook types are designed the specific characteristics of each of these hook components are optimized relative to the hook's intended purpose. For example, a delicate dry fly hook is made of thin wire with a tapered eye because weight is the overriding factor. Whereas Carlisle or Aberdeen light wire bait hooks make use of thin wire to reduce injury to live bait but the eyes are not tapered because weight is not an issue. Many factors contribute to hook design, including corrosion resistance, weight, strength, hooking efficiency, and whether the hook is being used for specific types of bait, on different types of lures or for different styles of flies. For each hook type, there are ranges of acceptable sizes. 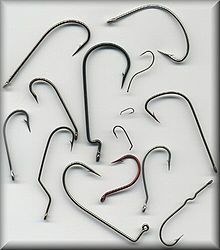 For all types of hooks, sizes range from 32 (the smallest) to 20/0 (the largest). The shape of the hook shank can vary widely from merely straight to all sorts of curves, kinks, bends and offsets. These different shapes contribute in some cases to better hook penetration, fly imitations or bait holding ability. Many hooks intended to hold dead or artificial baits have sliced shanks which create barbs for better baiting holding ability. Jig hooks are designed to have lead weight molded onto the hook shank. Hook descriptions may also include shank length as standard, extra long, 2XL, short, etc. and wire size such as fine wire, extra heavy, 2X heavy, etc. Hooks are designed as either single hooks—a single eye, shank and point; double hooks—a single eye merged with two shanks and points; or triple—a single eye merged with three shanks and three evenly spaced points. Double hooks are formed from a single piece of wire and may or may not have their shanks brazed together for strength. Treble hooks are formed by adding a single eyeless hook to a double hook and brazing all three shanks together. Double hooks are used on some artificial lures and are a traditional fly hook for Atlantic Salmon flies, but are otherwise fairly uncommon. Treble hooks are used on all sorts of artificial lures as well as for a wide variety of bait applications. Bait hook shapes and names include the Salmon Egg, Beak, O'Shaughnessy, Baitholder, Shark Hook, Aberdeen, Carlisle, Carp Hook, Tuna Circle, Offset Worm, Circle Hook, suicide hook, Long Shank, Short Shank, J Hook, Octopus Hook and Big Game Jobu hooks. Fly hook shapes include Sproat, Sneck, Limerick, Kendal, Viking, Captain Hamilton, Barleet, Swimming Nymph, Bend Back, Model Perfect, Keel, and Kink-shank. The hook point is probably the most important part of the hook. It is the point that must penetrate fish flesh and secure the fish. The profile of the hook point and its length influence how well the point penetrates. The barb influences how far the point penetrates, how much pressure is required to penetrate and ultimately the holding power of the hook. Hook points are mechanically (ground) or chemically sharpened. Some hooks are barbless. Historically, many ancient fish hooks were barbless, but today a barbless hook is used to make hook removal and fish release less stressful on the fish. Hook points are also described relative to their offset from the hook shank. A kirbed hook point is offset to the left, a straight point has no offset and a reversed point is offset to the right. A hook in a finger. Either surgery or pushing the hook through the finger are the least destructive methods to remove a barbed fishing hook. Care needs to be taken when handling hooks as they can 'hook' the user. If a hook goes in deep enough below the barb, pulling the hook out will tear the flesh. There are three methods to remove a hook. The first is by cutting the flesh to remove it. The second is to cut the eye of the hook off and then push the remainder of the hook through the flesh and the third is to place pressure on the shank towards the flesh which pulls the barb into the now oval hole then push the hook out the way it came in. Hook points are commonly referred to by these names: needle point, rolled-in, hollow, spear, beak, mini-barb, semi-dropped and knife edge. Some other hook point names are used for branding by manufacturers. The eye of a hook, although some hooks are technically eyeless, is the point where the hook is connected to the line. Hook eye design is usually optimized for either strength, weight and/or presentation. There are different types of eyes to the hooks. Typical eye types include the ring or ball eye, a brazed eye-the eye is fully closed, a tapered eye to reduce weight, a looped eye—traditional on Atlantic Salmon flies, needle eyes, and spade end—no eye at all, but a flattened area to allow secure snelling of the leader to the hook. Hook eyes can also be positioned one of three ways on the shank—up turned, down turned or straight. There are no internationally recognized standards for hooks and thus size is somewhat inconsistent between manufacturers. However, within a manufacturer's range of hooks, hook sizes are consistent. Hook sizes generally are referred to by a numbering system that places the size 1 hook in the middle of the size range. Smaller hooks are referenced by larger whole numbers (e.g. 1, 2, 3...). Larger hooks are referenced by increasing whole numbers followed by a slash and a zero (e.g. 1/0 (one aught), 2/0, 3/0...) as their size increases. The numbers represent relative sizes, normally associated with the gap (the distance from the point tip to the shank). The smallest size available is 32 and largest 20/0. ^ Ewalt, David M. (5 August 2005). "No. 19: The Fish Hook". Retrieved 23 April 2017. ^ a b Michael Price (16 September 2016). "World's oldest fish hook found on Okinawa". Science. Retrieved 6 August 2017. ^ "World's oldest fish hooks found in Japanese island cave". BBC news. 18 September 2016. Retrieved 18 September 2016. ^ O’Connor, Sue; Ono, Rintaro; Clarkson, Chris (25 November 2011). "Pelagic Fishing at 42,000 Years Before the Present and the Maritime Skills of Modern Humans". Science. 334 (6059): 1117–1121. doi:10.1126/science.1207703. ISSN 0036-8075. ^ "Mustad - Defining fishing hooks since 1877". Retrieved 23 April 2017. Wakeford, Jacqueline (1992). Fly Tying Tools and Materials. New York: Lyons & Burford, Publishers. ISBN 1-55821-183-7. Dunaway, Vic (1973). Vic Dunaway's Complete Book of Baits, Rigs & Tackle. Miami, FL: Wickstrom Press. ISBN 0-936240-12-1. Dalrymple, Byron W. (1976). How to Rig and Fish Fish and Natural Baits. New York: Funk & Wagnalls. Larson, Dr. Todd E.A. (2007). The History of the Fish Hook in America, Volume 1: From Forge to Machine. Cincinnati: The Whitefish Press. ISBN 978-0-9815102-3-1. This page was last edited on 25 March 2019, at 15:35 (UTC).